Studio of the artist; sale, F. Petit et Tedesco, Paris, 17-29 February 1864. M.A. Robaut, Paris (acquired at the above sale). Albert Pra, Paris; sale, Galerie Charpentier, Paris, 17 June 1938, lot 14. C. de Haulke; sale, Drouot Richelieu, Paris, 15 December 1989, lot 53 (acquired by the present owner). A. Robaut, L'Oeuvre complet d'Eugne Delacroix, Paris, 1885, p. 115, no. 426 (illustrated). Professor Lee Johnson has confirmed the authenticity of this work. Delacroix's 1832 journey to Morocco was perhaps the most important event in his life. The trip provided the artist with iconographic material that lasted a lifetime, and the sketches he made while there inspired some of his most important works. From that year on he continuously drew on his Moroccan experience and used a great number of sketches that he had made in Africa for many of his most successful compositions: Une rue Mkinez (Johnson, no. 352), painted the year of his return; Femmes d'Alger dans leur appartement (Johnson, no. 356), of 1834; Chef arabe dans une tribu (Johnson, no. 359), of 1837; Le sultan du Maroc ntour de sa garde (Johnson, no. 370), of 1845; and his last picture Camp arabe la nuit (Johnson, no. 418). All together, Delacroix painted nearly one hundred Arab subjects. Unlike David, Ingres, and Corot, Delacroix did not spend a formative artistic period in Rome. He was convinced that the neo-classicists and academicians were simply rehashing tired material in their art and so left for North Africa in order to observe first-hand the exotic and noble civilizations of its people. "Rome is no longer to be found in Rome," he wrote in a letter to Auguste Jal from Tangier (quoted. in L. Johnson, Delacroix in Morocco, exh. cat., Institut du Monde Arabe, Paris, 1994-1995, p. 116). Instead, for Delacroix, Morocco and its people represented what he referred to as an ideal "Homeric" society, which had been lost in the West since the time of ancient Greece. During the four months Delacroix travelled in Morocco, he became fascinated with the exotic orientalism that surrounded him. Afraid that he would forget the details of the overwhelming wealth of foreign culture with which he came into contact --the local customs, the Islamic dress, the noble character of the people-- he sketched furiously and often with minute attention to detail. Yet something changed on Delacroix's return to France when he began to construct compositions based on his travels and observations. "I began to make something tolerable of my African journey only when I had so far forgotten the trivial details as to recall in my pictures just the striking and poetic side of the subject; up to that time, I had been haunted by the passion for accuracy that most people mistake for truth" (quoted in op. cit., p. 118). The present watercolor was painted almost two years after Delacroix's return from Africa. 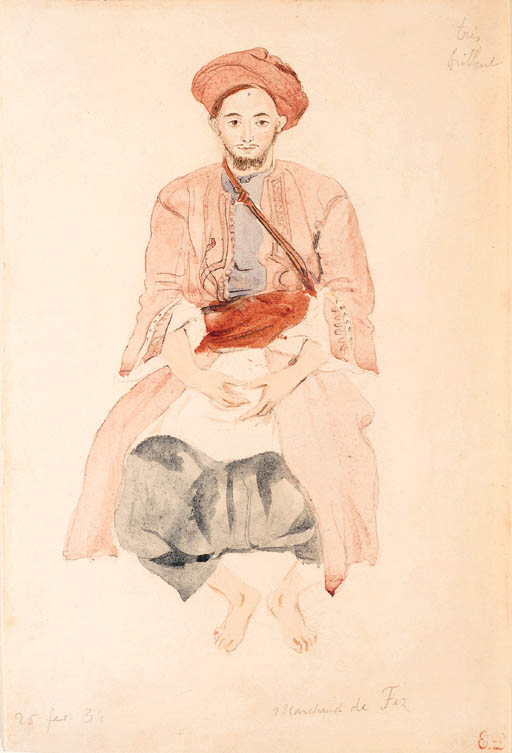 The portrayal of the merchant is looser and freer than many of the sketches in the Moroccan notebooks and reveals the artist's remaining interest in the local costumes. Here Delacroix made the most of his ability to manipulate expressive use of pose and gesture; the Arab merchant possesses the calm nobility which the artist associated with the ordinary citizens of Morocco. Ever concerned with the control of color and light to provide structure within a composition, he probably made the notation "trs brillant [sic]" in the upper left corner of the present drawing in reference to his satisfaction with the color and portrayal of the Arab. Please note that this work was drawn in 1834.